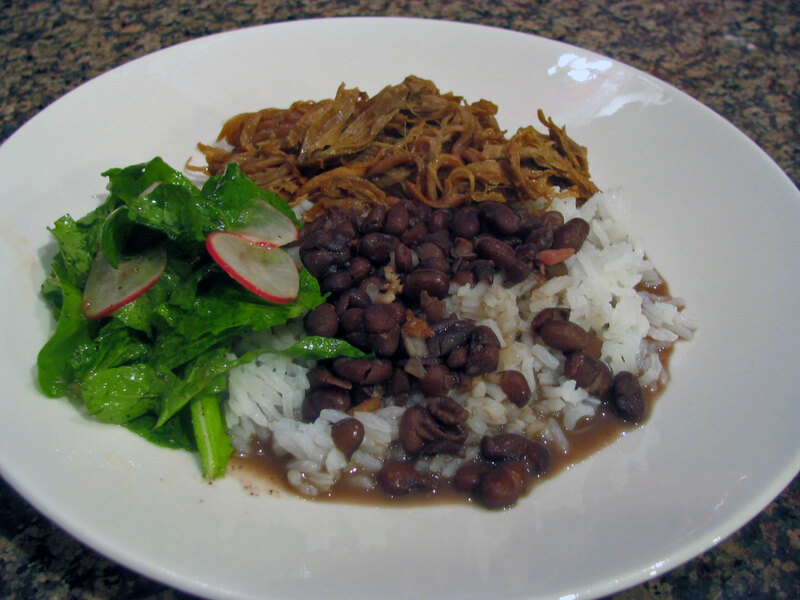 Always together, rice and beans are the staple of Brazilian home-cooking. As a child growing up, I had them many times every week, alongside beef, chicken, pork, or even seafood. In Rio de Janeiro black beans are more common, whereas in Sao Paulo you’ll see a more reddish variety. I’m from Sao Paulo, but my Mom was born and raised in Rio, so in our home you never knew what kind of beans to expect. Indeed, cooking beans is a weekly endeavor in Brazil: you make enough to last the whole week, then you make it again. And again. And again. It sits in the fridge, waiting, getting better each day. 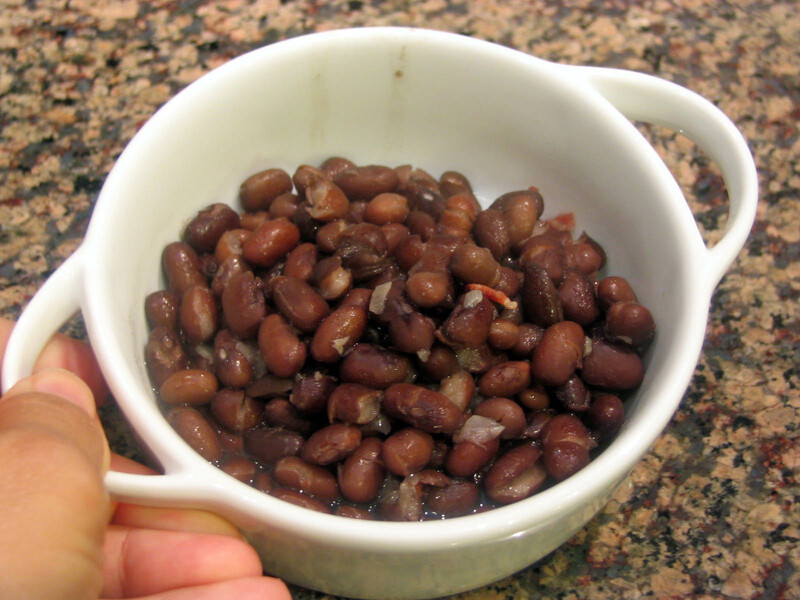 Place the beans in a bowl and cover them with two inches of water. Allow them to soak overnight (I normally do that early in the morning and cook the beans in the evening). Drain, discarding the water. Place the soaked beans in a pressure cooker, add cold water to cover by 1 inch, add the bay leaves, and bring it to a boil. Cook under pressure for 15 minutes, then release the pressure. If you don’t have a pressure cooker, help the economy and buy one right away! 😉 Actually, you can cook them in a normal pan, but it will take 1 to 2 hours. Cook until the beans become tender (they can be prepared up to this point and then kept in the fridge overnight). Heat the oil in a small frying pan. Sautee the bacon pieces until they are golden, add the onion and sautee more, until dark golden. You do want some color here. When the onion is getting dark, add the garlic and cumin and sautee for a couple of minutes. Season lightly with salt and pepper, add red pepper flakes. If you made the beans the day before, heat them until boiling, then add the bacon/onion mixture plus all the oil accumulated in the pan. Mix it all well and allow the beans to simmer for a while (10 to 30 minutes), uncovered. 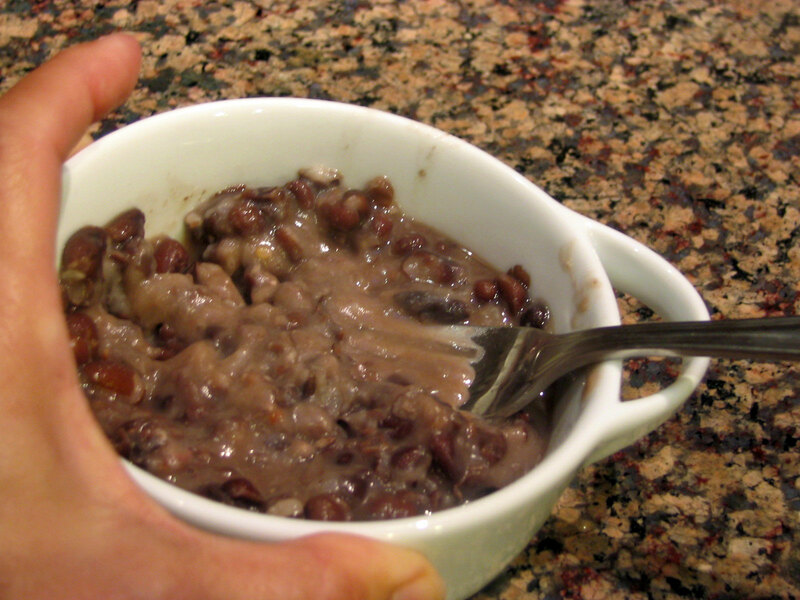 Remove some of the beans into a small bowl and smash the grains with a fork, forming a paste. Return the paste to the simmering pan and cook everything for 5 or 10 more minutes. Add salt to your taste; add more pepper and cilantro if you desire. Remove the bay leaves. Grill or fry some hot sausages, cut them in thick slices and add to the beans together with the onion mixture. In this case, no need to use bacon. Use pancetta (about 6 thin slices, diced) instead of bacon, add celery to the onion mixture, and some flat leaf parsley at the end instead of cilantro. Comments: Cooking time for beans vary a lot. With a pressure cooker, it is possible to overcook, therefore, check them out after 15 minutes, and continue simmering off-pressure. Buy different brands, experiment, and decide which is your favorite. Personally, I think nothing compares to Brazilian beans, but here in the US I go for Mexican. Play with the amount of liquid, some people like their beans very soupy, some prefer a thicker version. All you have to do is gently cook it down, uncovered. Do not add any thickening agent, such as a roux, or cornstarch. Those have no place in this dish. OK, these beans are going to a BD party we have this weekend! I just happen to have a couple of packages of black beans! How much is a slab of bacon? Or how much sausage or pancetta would I use? a pound, a cup, some other amount? And is this only a sauce for rice served in a larger menu, or couldn’t you eat this (the rice and beans) as a small meal, like lunch at home even without the meat? the sausage part is absolutely flexible – 2 cups of beans make a lot, will feed 8 people. Add as much sausage as people would eat, I’d say 4 would be enough. If you add more, it doesn’t hurt anything. as far as overcooking – the bean will have no bite at all, will be very soft and mushy. It will still be tasty, but not as good. This is the kind of dish that can take a lot of abuse, though…. almost impossible to ruin it. Watery beans are horrible, but even that mistake can be easily fixed by simmering it down. I know what you mean about making too much. The hostess is making turkey chile and vegetarian chile. Jim is baking a carrot cake for them as that was their wedding cake and it’s his BD. About 50 people so this recipe should work just fine. Thanks! there will be rice too, I suppose? Sally, your black bean recipe was a hit! I saw your entry about the bacon. Our friends are such foodies and they appreciate anything authentic. I told them about you and your blog. I just saw a recipe in Michael Chiarello’s show, for Cuban style black beans – a lot more involved, including red wine and vinegar in the prep, quite unusual as far as Brazilian beans are concerned. But he also mashed the beans to give the dish substance. I thought that was interesting…. I bought the black beans right after you put this recipe up, but did not get around to making your recipe. But my daughter is here visiting now, and she wanted to cook something not-too-difficult. I showed her your recipe and away she went. Used the beans I bought (Mexican) but went to Whole Foods (to buy herself some mochi) and came home with some Virginia ham. I’m kind of “off” bacon (it is so so salty). She tasted pancetta they had, but they convinced her to try the Virginia ham. She chose one she liked. So there was a small difference from your recipe. But oh my goodness, those beans are wonderful!!! Yours is a great basic recipe that makes a very satisfying meal. Good ingredients, cooked well, and so satisfying. Absolutely a great reminder about how simple and delightful simplicity is. A poem, a recipe, food as best as it can be. I am looking forward to your feijoada! So glad you enjoyed it! Now you know what Brazilian home-cooking is all about…. I will tell my Mom, I’m sure she will be very happy! I’ve been hunting for a decent recipe since we got back from Brazil in July – after a failed attempt with another very vague recipe, I’ve given yours a go and they taste fantastic! Thank you!! I cooked these beans according to your recipe tonight, and they were delicious! I have tried cooking black beans before and they were always pretty bad–nearly inedible. But this recipe worked perfectly (I do not have a panela de pressão) . Thank you! I want to check out some of your other recipes now. Made these for an International Night at Church; everyone loved them. The women from Central and South America thought they were amazing! They are much better than the last pot of black beans I made, which turned out too watery and didn’t have all the flavors my husband remembered from when he lived in Bahia, but these did. Thanks!